KABUL, Afghanistan (AP) -- The Islamic State group has claimed responsibility for a suicide bombing on a peaceful protest in the Afghan capital on Saturday that killed at least 80 people and wounded more than 200, marking the first time the extremists have struck Kabul and raising fears of their growing strength and capability in Afghanistan. The attack was the deadliest to hit Kabul in 15 years of civil war. It struck a demonstration by Afghanistan's Hazara ethnic community, who were marching for a major regional power line to be routed through their home province. The Hazaras are Shiite Muslims, most Afghans are Sunnis. Footage on Afghan television and photographs posted on social media showed a scene of horror and carnage, with numerous bodies and body parts spread across the square. Bloodied survivors were seen being dragged clear for help, others walked around dazed or screaming. Two suicide bombers had attempted to target the demonstrators, but one of them was shot by police before he could detonate his explosives, according to Haroon Chakhansuri, a spokesman for Afghan President Ashraf Ghani. He said that three city district police chiefs were injured and another three security personnel were killed. Witnesses said that immediately after the blast, security forces shot in the air to disperse the crowd. Secondary attacks have been known to target people who come to the aid of those wounded in a first explosion. Road blocks that had been set up overnight to prevent the marchers accessing the city center or the presidential palace hampered efforts to transfer some of the wounded to the hospital, witnesses said. Angry demonstrators sealed some of the area around the square, and prevented police and other security forces from entering. Some threw stones at security forces. Outside hospitals, huge queues formed as the public offered to donate blood. 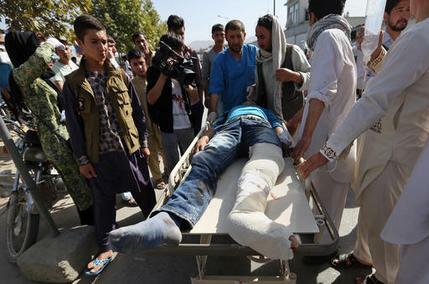 The Afghan Interior Ministry said that 81 people had been killed and 231 wounded in the bombing. The ministry's deputy spokesman, Najib Danish, said the blast was the biggest in Afghanistan since 2001, when the Taliban launched their brutal insurgency after they were toppled by the 2001 U.S. invasion. According to the presidential spokesman, Chakhansuri, the organizers of the march had been warned of the possibility of an attack. "We had intelligence over recent days and it was shared with the demonstration organizers, we shared our concerns because we knew that terrorists wanted to bring sectarianism to our community," he said. Senior Hazara leaders were notably absent despite having attended a similar protest in May. The organizers could not be immediately contacted for comment on Chakhansuri's allegations. The Islamic State group claimed responsibility for the attack in a statement issued by its news agency, Aamaq. IS has had a presence on Afghanistan's eastern border with Pakistan, mainly in Nangarhar province, for the past year, but this is the first time the extremist group has struck the Afghan capital. The bombing raises concerns over IS's growing capabilities in Afghanistan. Officials believe the fighters are made up of disaffected Taliban insurgents and members of Pakistani militant groups, and that they receive some funding and arms from IS in Syria and Iraq. In Nangarhar they have fought Taliban fighters as well as Afghan security forces, sometimes seizing control of whole districts in the east of the province. A surge in the number of attacks worldwide linked to the Islamic State group has been seen as an attempt to distract from a string of battlefield losses suffered by the extremists in Syria and Iraq, where the borders of their self-styled caliphate are shrinking. During the holy month of Ramadan - which ended at the start of July - a series of attacks, most linked to the Islamic State group, killed nearly 350 people in eight countries. Ghani has announced an upcoming military offensive in Nangarhar, expected to start within days, aimed at eliminating IS from the country. The Taliban issued a statement denying involvement in Saturday's attack, describing it as an attempt by IS to "ignite civil war." The statement may in part reflect the animosity between the two militant groups; Hazara were especially persecuted during the Taliban's extremist Sunni rule between 1996 and 2001. Ghani declared Sunday a day of national mourning. He ordered a commission be set up to investigate the incident and described the attack as a clear effort to divide Shiites and Sunnis. The Interior Ministry issued a ban on "any kind of public gathering and demonstration" for the next 10 days. The move could be aimed at controlling any outbreaks of sectarian animosity. The second-most deadly attack to hit Kabul since 2001 also targeted Shiites and was seen as an attempt to stoke sectarian violence. In 2011 a suicide bomber attacked worshippers marking Ashura, when Shiites commemorate the death of the prophet Mohammed's grandson, killing 70 people. That attack was linked to a Pakistani militant group. The commander of U.S. and NATO forces in Afghanistan, U.S. Army Gen. John Nicholson, denounced the attack. He said in a statement that "we strongly condemn the actions of Afghanistan's enemies of peace and remain firmly committed to supporting our Afghan partners and the National Unity Government." The U.S embassy in Kabul also issued a condemnation. In Washington, White House spokesman Josh Earnest said the "heinous attack was made all the more despicable by the fact that it targeted a peaceful demonstration." He said the U.S. and the international community stand firmly with the Afghan people and their government "to confront the forces that threaten Afghanistan's security, stability and prosperity." The head of the United Nations assistance mission in Afghanistan, Tadamichi Yamamoto, called the attack a "war crime" because it had specifically targeted a large number of civilians. U.N. Secretary General Ban Ki-moon called it a "despicable crime" that "targeted citizens peacefully exercising their fundamental human rights." Violence had been widely feared at the Hazaras' demonstration, the second to take place over the electric power line. The so-called TUTAP power line is backed by the Asian Development Bank with involvement of Turkmenistan, Uzbekistan, Tajikistan, Afghanistan and Pakistan. The original plan routed the line through the Hazara heartland of Bamiyan province, but was changed in 2013 by the previous Afghan government. Leaders of the marches have said that the rerouting was evidence of bias against the Hazara community, which accounts for up to 15 percent of Afghanistan's estimated 30 million-strong population. They are considered the poorest of the country's ethnic groups, and say they suffer pervasive discrimination. Associated Press Writer Karim Sharifi in Kabul, Afghanistan contributed to this report. 0 Response to "IS ATTACKS PROTEST IN AFGHAN CAPITAL, KILLS 80 PEOPLE"